On Saturday, February 9, 2019, United Way of Greater Portland’s CA$H initiative and KeyBank will partner to host the annual Super Refund Saturday event. KeyBank employees will work alongside volunteers from other organizations to provide free tax preparation services to those who need it most, helping low- to moderate-income individuals and families determine their eligibility for the Earned Income Tax Credit (EITC). Super Refund Saturday will be held on February 9 from 9:00 a.m. to 3:00 p.m. at Goodwill offices at 75 Washington Avenue, Portland. Residents wishing to receiving tax filing assistance must pre-register for an appointment by calling 207-289-7013 or by sending an email request to CASH@goodwillnne.org. 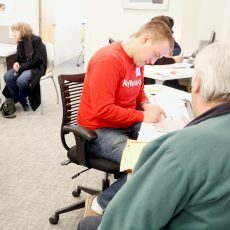 In 2018, KeyBank volunteers across the country helped prepare 560 filings nationally, which resulted in a total of $1.2 million in refunds; more than half coming from EITC filings. This year, KeyBank will partner with community organizations in 12 metro areas to hold Super Refund Saturday events on February 2: Akron, OH; Ann Arbor, MI; Cleveland, OH; Columbus, OH: Dayton, OH; Denver, CO; Hartford, CT; Indianapolis, IN; New Haven, CT; Portland, ME; Seattle, WA; and, Tacoma, WA. Additionally, KeyBank will provide tax preparation support in Buffalo, NY on February 9 and throughout the tax season in partnership with a local organization. CA$H (Creating Assets, Savings and Hope), an initiative of United Way of Greater Portland, is a partnership with Goodwill Northern New England and the Greater Portland CA$H Coalition. Coalition members work together to offer free tax preparation and asset building events, and provide education about community resources that can help people increase their financial literacy, reduce debt, and build savings. KeyCorp’s roots trace back 190 years to Albany, New York. Headquartered in Cleveland, Ohio, Key is one of the nation’s largest bank-based financial services companies, with assets of approximately $139.6 billion at December 31, 2018. Key provides deposit, lending, cash management, and investment services to individuals and businesses in 15 states under the name KeyBank National Association through a network of over 1,100 branches and more than 1,500 ATMs. Key also provides a broad range of sophisticated corporate and investment banking products, such as merger and acquisition advice, public and private debt and equity, syndications and derivatives to middle market companies in selected industries throughout the United States under the KeyBank Capital Markets trade name. For more information, visit https://www.key.com/. KeyBank is Member FDIC.